Thomas Day's review"Limited Use for Everything but Live Recording"
The controls are cumbersome, at best. Between the Menu switch and the arrow slide and switch, you can eventually get most functions to work if you are patient and memorize the weird defaults. Unfortunately, the mixer does not function as a tracking mixer, final mixdown only. As if anyone but a very poorly equipped hobbyist would ever mix down using the H6. An obvious use for the H6 would be as a portable, free-standing recorder. My expectation was that I could add a sync/scratch track to a folder and add other instruments remotely to the recording for later extraction and adding to a session in Pro Tools or Logic, etc. Zoom engineers have decided that "overdubbing" is only for adding one track at a time. Oddly, Zoom has taken 50 years to not quite provide the function of a 1970s Teac 2340 reel-to-reel. Someone needed to learn something about multitrack recording before being allowed to play with product development. The sound quality of the H6 preamps is fine. The preamp controls are clearly marked and easy to use. The XY, M-S, and extra non-phantom-capable extra pair of pres are decent. If what you want to do is record 6 tracks simultaneously and as a free-standing remote recording deck, the H6 will be fine. I discovered that the engineers didn't think much about typical remote applications, though. Connecting the Zoom pres to a splitter that allows a preamp's phantom power to the Zoom will wreak the H6's phantom power. It's hard to imagine not being able to protect a current limited phantom supply circuit from something as common as linked phantom power, but Zoom failed that test. Be super careful with splitter use. If they aren't fully isolated, the H6 will probably self-destruct. Obviously a work-around to the overdubbing flaw is to use the H6 as an interface and do the sync signal with a computer. As an interface, the H6 has a lot of better priced and featured competition. The whole point of the H6 should have been to be a free-standing, multitrack recording system. 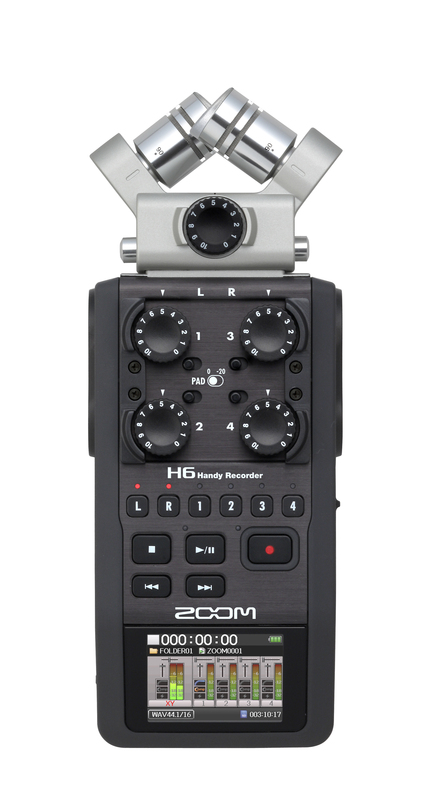 DebErney's review"H6 is perfect EXCEPT it doesn't allow overdub with onboard mic/capsule"
Having owned the Zoom H4n a few years ago, the H6 is like revisiting an old friend that had lost weight, got in shape and stopped cussing all the time. The interface is really sleek, easy to get to, easy to adjust, and easy to see recording volumes. The volume knobs on the front are a very welcome improvement over the H4n. I liked the H4n but, always hated having to mess with the menus before recording. Never a good option at band practice as it took so long to go through the menu system and you could never be certain what kind of volumes you were recording. I recorded with the H6 as a stand alone using the onboard MS microphone, as well as two DI outputs from my Fishman Artist amp, into the 1/4″ inputs of the H6. The MS mic for the Zoom H6 is very clean, full, and smooth on both vocals and guitar. I even experimented recording with an iPad, using the iPad as an instrument into one of the Zoom H6 tracks that sounded amazing. I use a little app called ThumbJam. Love the Cello on ThumbJam and I can’t believe how well it recorded. Used the headphone jack from the iPad into channel 2 of the H6, with a 1/4″ plugin. The H6 onboard M/S mic recordings of the guitar finger picking and vocals came out better than the plug in from the Fishman DI output. I was able to hear every note, clearly, ringing vibrantly with the onboard M/S Mic Capsule. The recorded tracks from the Fishman DI outputs weren't as clean but gave a nice mix to the finished Mp4. Also used the zoom H6 interface with Logic Pro. It worked well as an interface but, got a bit muddy after several tracks. It was all usable though not the same sound quality of the direct MS mic. With the H4n it was nice to be able to select which input to use for each track. With the H6 that isn't an option. When you record with the onboard mic capsules, you get a stereo L/R track that can't be overdubbed. Nor can you record with the onboard mic capsuled to another track/channel other than the L/R tracks, making overdubs using the onboard mic capsules impossible. I did call Zoom about this and was told the mic capsules are "hardwired" into the unit which doesn't allow the overdub or re-assignment of tracks. Here are two recordings using the H6. One version has the H6 recordings along with tracks using the H6 as an audio interface with Logic Pro X. The second version is the clean version with just the H6 inputs, no effects, no processing. jaymes.moore's review"An audiophile's travel buddy!" 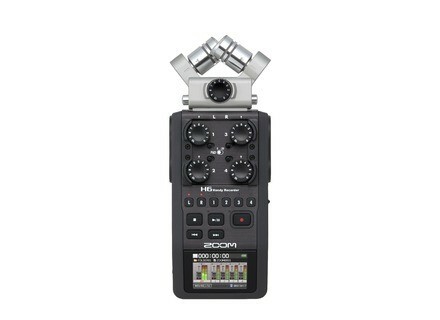 I did a lot of research, reading countless reviews and watching many video tutorials before choosing the Zoom H6 as my portable recorder of choice. Within the price-range and portability, it seemed the Zoom H6 couldn't be rivalled in terms of features. So what happened when I finally got it? Well at first, I was quite shocked at its size! Honestly, I was expecting something 50-60% bigger and was pleasantly surprised at how small and light it was. As I dove into using it right away, I found all of the features that sold me on it were easily accessible and equally useful. My primary use for the H6 will be for on-site sound recording for film. For my approach to sound design, having 4 independent, low-noise preamps with individual gain knobs on the outside of the device was a key feature. I like to set up the X/Y microphone as a general stereo distance mic centred on my subject. Then I can use preamps 1 and 2 to drive two shotgun mics forming a closer x/y field to my subject. Then I like to use mic preamps 3 and 4 to power two condenser mics further and to the sides of my subject, to capture the performance space. Being able to do all of this simultaneously while monitoring all of my levels on simple display screen without any thumbing through menus is a huge advantage to the H6. As a musician, I was most excited to dive into the M/S microphone for recording acoustic demos. I travel often with my Martin LXK2 acoustic and have found the Zoom H6 to be a competent companion for recording demos on the go. The M/S mic is perfect for capturing a raw sound that I can upload into Pro Tools later and adjust the stereo image to taste. Below I walk through an acoustic demo with the H6. There's many reviews and technical tutorials that go in depth with the professional applications for the H6 and I suggest checking them out! But if you're also a musician looking for a good multi-track recorder, then thrown the rule book out the window and play with the variety of different mic inserts and features. All in all, the H6 is an incredibly powerful, yet intuitive recording tool that after a little initial learning curve can be an audiophiles perfect travel buddy! rob_servant's review (This content has been automatically translated from French)" Super value for money, but ..."
I tried the H4N and the Edirol R-4 and a souddevice mixer whose output was connected to a recorder. For value for money, the H6 is unbeatable! -The Control headphone volume is under the grip of such headphones: vriament impractical to adjust the volume listening or recording. - Almost all controls (low-cut, compressors, phantom, etc.) are only accessible through menus. Setting long especially if you want to record quickly! - I used it for a shoot of fiction. The ergonomics of the XLR is poorly suited for use in a bag soundman. The best value on the market in my opinion. For portable recorder, for a sound card or a register of fiction: Great! I do not take for the documentary: it's too long to make adjustments and you can miss a catch. I do not have yet but it is on the list! sibanak's review (This content has been automatically translated from French)" Really top." I use it for a month almost every day. I have not tried "other models in the same genre but rather pro machines (DAT location, Nagra IV S, mixer etc ...) with Schoeps or Brüel & Kjær and other AKG. This does not me because I'm a specialist rather studio. H6 I waited for preamps corrects.J 'still have a little trouble deciding on the choice between MS and XY. What I like most is the ability to change the pickups as the objectives of photos and all entries device. The sound quality is excellent catch for the price. Another thing that kills the sound card. plug it into a computer pronto, giving you access to 6in and 2 out. I tried taking a Martin guitar and then I could go in VST without latency (64 samples so imperceptible with a pick). So if you are looking for a great sound card nomadic ben voila! This is a great tool to get sound for sound guys too rich and sound designers and musicians (you can play the vase, fork or rain stick). I added that 96kHz 24-bit pitch changes become very interesting. I also think people in the image, with 6 in you are ready to ambiances, HF, and even four dynamic phantom power supplies! I think famous brands have exploded the price for the third possibilities ! So, really, head over to this machine. What I like least is the ergonomics a bit old and not lit in the dark retro buttons and lack of function macro front. trims should have been notched because the slightest touch could turn ca. Finally, regarding fied Sound recorder, the Tascam DR 40 apparently fared better so feel free to listen and read the tests to suit your needs! Another small stone garden threading attachment to a tripod. ben if it records sound a thread mic stand is not logical (or failing adapter)? jean.cadic's review (This content has been automatically translated from French)" Super H6"
I acquired the H6 in November after 5 years of use H2 and there is no picture: it is a wonder. Great ergonomics with its "buttons" input setup, even if you do not like those who have made the test. This is not a smartphone to tell anything about "FesseDeBouc" but an audio recorder. And the backup file is really handy if you have not adjusted the levels. And autonomy (on battery) is "giant" compared to H2 which took an hour ... This requires 4 AA batteries or rechargeable batteries and this is its main fault or her weight and size. But we have something that fits in the hand and well thought out at the recording controls. Perhaps a little vintage, but it is rather an advantage as finely adjust levels on a touch interface is not the top level accuracy. Not to mention the possibility of changing microphones, audio qualities. Another flaw: an IR remote would have been more appropriate as a wired model, when you can not be near the unit. Other than that no complaints! older13's review (This content has been automatically translated from French)" Not perfect, but good value for money"
Product bought new H4 to replace a first generation who began to MALFUNCTION. I have not considered other competing product because the H6 is unique in its price category. Most notable is its versatility: Interchangeable internal mics, 6-track simultaneous recording, compact and cheap. The increase compared to H4 and H4n is enormous, especially in terms of ergonomics. It is now well adapted to what must serve a portable recorder: record field. The sound is not perfect, but for the price it is acceptable to. - Finish the plastic shell "rubber effect". It's not likely to take the time (this type of coating tends to "peel"), but it limits the handling noise. The micro blocks are fully interchangeable metal, and also the locking system. It inspires confidence. - Analog Potentiometers level adjustment for each input. Simple and effective. Scalloped would have been better. - The backup to -12 dB to avoid saturation. But only on the stereo input (built-in microphones or XLR / Jack optional module). - The carrying case well designed and of good quality. - The thread mic stand (1/8) robust and well placed. - Power of 4 batteries R6, which is used to supply 48V external microphones without putting flat batteries in 2 minutes. - Screen too small: the meters are virtually unreadable. - Still too laborious manipulations in menus, for example to initiate the phantom power supply or adjusting the monitor mixer is frankly horrifying. - No phantom power on the XLR / Jack optional module, which is the only one to have the backup to -12 dB! - The preamps are a good surprise: much higher than the H4n and especially H4. With a pair of external microphones Rode NT5, I get almost the same result as a Track Ultra M-Audio interface Fast in background noise, which is not bad at all. Headroom is still larger with the M-Audio. No noticeable difference in sound. - The two micro modules provided sufficient sensitivity for recording near-field but insufficient as soon as we move away from the source. First test on an acoustic guitar folk 1m50: to wedge the crete-6dB FS, I had to put the gain to 10 (max) on the built-in mics (XY or MS), but only 7.5 in pair of NT5 XY couple connected to the XLR inputs (which are still that of the entry level). Result: the background goes so sensitive with the internal mics: + 10dB on my test. I have not tried yet, but it may become prohibitive on the "field recording". But it was even worse on the H4, which meant that I did not use that on the line inputs. - The measured noise level (with Adobe Audition) on the MS cup is equivalent to the XY pair, but the audio is different: Subjectively, the module MS seems to blow over. Question spectral distribution without doubt. - Asked sound, the record is much clearer than previous generations of Zoom. It has a significantly higher resolution printing, but I found the XY pair a bit garish, significantly more than Rode NT5 are bright enough yet. On a folk guitar, it can become unpleasant limit. MS torque is much rounder and seems much better suited to the voice or instruments. Review: Not perfect, but for the price, could we ask for more? My only real regret is the built-in mics. Their sensitivity is too low to achieve good quality recording as soon as you move away a bit from the source. The XY pair is a bit garish. MS torque is much nicer, but breath a bit too. The internal mics are rather troubleshooting in my opinion. Provide good external microphones (if possible with built-in power to benefit from the backup copy to 12dB on the optional XLR module), and an expensive recording system is obtained is not good enough. If needed again, I do it again this choice without hesitation, because I do not have the means of a portable multi-track recorder professional that would cost (at least) 10x more expensive. jean77's review (This content has been automatically translated from French)" Very good product"
I'm interested in a recorder is primarily ... sound. Compared to other Zoom, often criticized for their side "sound a little veiled" Zoom H6 is really good. I tested the external microphone (MS) round interview and it gives a really suprenant result clarity. He has no problems with plosives, used close to the inverse of the micro XY is very sensitive, perhaps too (hard to put it on a table with a small tripod, the risk of hearing all noise table recording). Tested with external microphones, in a comparative test with other recorders (Marantz PDM 661 or Sound Device 702), again, the zoom is doing surprisingly well. The sound is not of infinite wealth, but it is very clear, plus, it seems to me, with the Zoom H4n. Large + otherwise: set very fast route (Zoom H4n, especially in Stamina mode is a disaster on this point), very crisp display, ability to save a copy of the record-12dbs, to be sure have not saturated track. And it is a true multitrack childish of use (load itself to a mixed after course). Really, a recorder that I recommend to all points of view.